Live intentionally by understanding what really matters to you. Figuring out what matters helps you live according to values and have purpose every day. Most of us get stuck on trying to figure out a large overarching purpose rather than focusing on how to live intentionally. When I was in college my roommate spent the whole four years thinking about what her major would be. She’s a really smart person and did really well in school but got stuck on the question of what she wanted with her life. Frankly, I think she was the one doing things right! How in the world does an eighteen year old know what she wants to do with the rest of her life? She hasn’t experienced enough of life yet to know. Yet, most of us make our career choices around that time and for the most part it works out just fine. Because you start with something you like and you make it work. We need to learn from this person. (Let’s assume the person has things in place that allow this to be a responsible decision). She isn’t afraid another job won’t come along because she feels comfortable in the belief that it will work out. She feels comfortable in her abilities. She hasn’t lost her identity in her work. She thinks about purpose differently. She thinks about what is really important to her and makes choices according to that. This is what it means to live intentionally. She lives by values rather than by some overarching single purpose. 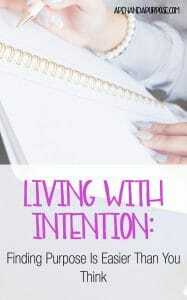 Choosing to live intentionally provides direction and a plan for how to behave in your daily life. This intention comes from your values and from what is important to you. When you pay attention to your values and how you would like to live out those values, it helps you to make moment to moment decisions in your life. This is much more useful than “living a purpose.” Instead, there are multiple purposes directed by different values. In the example I gave above with the person leaving her job after forced overtime, she made her decision based on the value of family or being there for her child. This does not mean that work wasn’t important to her, but that something about her work conflicted with one of her core values. Values are those things that guide how you live your life. Values are based on what is most important to you. They act as guideposts to help set your intentions by. When you know your values, you make better choices about where to focus your attention and energy. I’ve created a cheatsheet to help you determine your values and live intentionally according tot hose values. How Do Values Help You Focus? When you know what your most important values are, you can reflect on these when making decisions about what is important for you to be focusing your attention on. These values influence your choices whether you think about them or not, but being mindful of them helps you put them first. When something comes up that you are conflicted about, you can rely on these important values to make decisions and to be intentional about things. For example, you might decide to go into your day with the intention that you will help at least one other person. Or you may go into your day with the intention of speaking up about something that’s interfering with your ability to enjoy your work. When we live according to our values, it makes it much easier to make hard decisions about what we should and shouldn’t be doing with our time. Check out the book Essentialism for clear direction on how to put this into practice. When you know what really matters to you, you can cut out all the extraneous stuff that just keeps you busy and enjoy your life much more. Instead of getting lost in all of the busyness and doing things that don’t matter in the scheme of things, you focus on living your values and feeling good about yourself. Knowing you are living by your values and intentionally doing so helps you to figure out what hte next right thing is. It helps you get clear on what to do next. Knowing your values helps you start, it releases you from blocks. Download my worksheet here to help you clarify your values so you can focus on what matters. Teach Yourself Creativity: Are You Causing Your Creative Block?